SOME PEOPLE THINK OF THIS MONTH as something of a dull stopgap between the fashion-focused September and the pre-Christmas rush of November and December. But nothing could be further from the truth! First off, you have Indonesia Tatler to guide you to the most happening spots in town, like the splendid new Japanese restaurant OKU, located in one of our favourite haunts, Hotel Indonesia Kempinski. And secondly, on a more serious note, it’s Breast Cancer Awareness Month. Cancer statistics are truly terrifying, and I’m sure that each and every one of you has, like me, had this dreadful disease affect you or someone close to you in some way. As such, we have joined forces with the Indonesian Breast Cancer Foundation this issue and crafted a feature with 18 “muses” who were selected by the foundation as a broad cross-section of influencers who can help raise awareness of the need to find a cure for cancer. They include celebrities such as Mike Lewis, Joe Taslim, Andien, Farah Quinn, Reza Rahadian and Raline Shah, as well as Linda Gumelar, who leads the foundation and who is an inspirational cancer survivor herself, plus Lauren Sulistiawati and Maura Kwik, among many others. 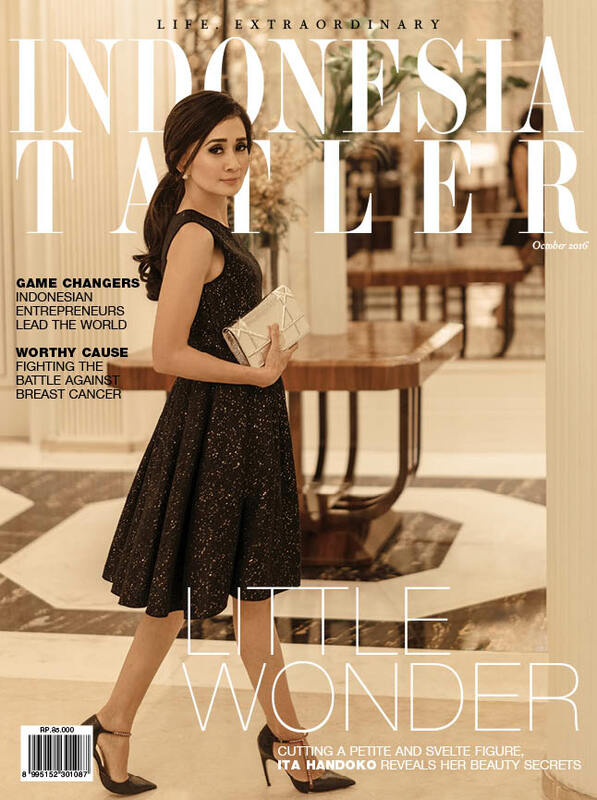 On a lighter note, our cover this issue features the delectable, petite Ita Handoko decked out in delightful Dior selected especially for our photo shoot. This beautiful socialite is passionate about fashion and beauty, as we find out in our exclusive Q&A session with her, in which she reveals her secrets to having the perfect complexion (being married to a well-known dermatologist helps, of course). Ita is also a mother to two lovely children and manages that delicate balancing act of having her cake and eating it, too. Lastly, we turn our attention to homes and living this month, chatting about design and architecture with the founders, owners and managers of some of the country’s best known interiors companies. These include Karina Cheung from Bika, Andy Lim from Malinda, Andy and Martin Lim from Joop, and Michelle Shang from Moie. If you only take one thing away from this issue, let it be this: you only get one shot at life, and as cancer survivors near and dear, as well as those dearly departed, will all tell you: live it to the fullest, enjoy the finer things, and don’t take it all too seriously. Happy reading!